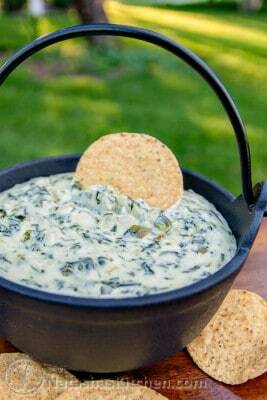 This Spinach Artichoke Dip recipe is too easy; pretty much heating and mixing. This dip is irresistibly creamy and every bite is loaded with spinach and artichokes. In a medium pot over medium heat, melt together 8oz cream cheese, 16 oz sour cream, 1 stick butter and 1.5-2 cups parmesan cheese, stirring frequently until melted and an even consistency. It should start to bubble. Stir in coarsely chopped artichoke hearts, your drained jalapenos and drained spinach (I used my hands to squeeze spinach over the sink to remove excess water). Finally, stir in 2-3 pressed garlic cloves. Serve hot with chips or crackers or toasted baguettes.